Pressure washing is like a magic trick. But there are no rabbits involved, nor doves, not even playing cards. The friendly folks at Peace Frog can make the dirt disappear with local power washing services in and around Austin. If you need house pressure washing, roof washing, stucco or stone cleaning, or you have another surface that needs cleaning with a bit more oomph than elbow grease can muster, then we can help. We work hard to ensure clean driveways, walkways, and patios on properties in Cedar Park, Manor, Pflugerville, Round Rock, Leander, Taylor, Hutto, Lakeway, Lago Vista, Leander, Georgetown and in Austin. 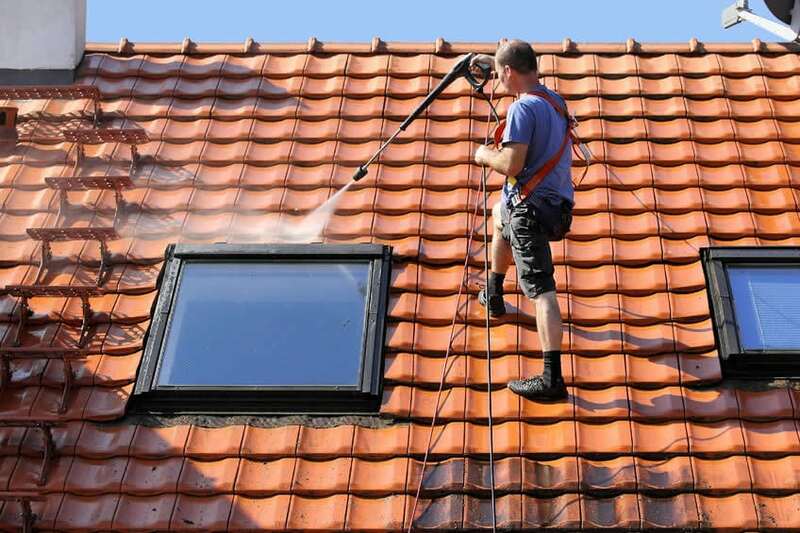 Along with house power washing, we also provide pressure cleaning and power washing services for your roof. Whether you have shingles, tiles, or a metal roof, cleaning the surface of your home on a regular basis can extend the life of your home. We provide eco-friendly roof cleaning, when possible, that leaves your roof cleaner, free of moss, mold, and stains. We want to be your go-to roof cleaning business, the cleaning contractor you call when it’s time for some roof pressure washing. When you call Peace Frog about our residential power washing services, we’re happy to listen to what you need and to offer the best solution. We’ll schedule your appointment when it’s convenient for you, and on the day of your appointment we’ll show up on time. At Peace Frog, we believe in being on the same page with our customers, every step of the way, so we strive for good, honest communication. We also believe in leaving the world a better place than we found it. Subsequently, we don’t just focus on the big things, like high-pressure roof cleaning and deck cleaning, we also tackle smaller issues, such as spider web removal and mud dauber removal. Our pressure washing prowess can remove algae and mold, which can be difficult to remove on your own. We can wash your outdoor furniture and get your patio area looking better than ever, with brilliantly clean limestone and bricks. With Peace Frog on your side, you can look forward to outdoor entertaining without worrying about dirt or stains catching your guests’ attention. Perhaps the thing we at Peace Frog are best known for, aside from our exceptional efficiency and meticulous approach to each and every job, is our customer service. Over the years, we have found that when you are happy doing your job, that happiness will spread. We love what we do, and we enjoy every day we get to hop in a vehicle emblazoned with our peace sign-flashing frog mascot and drive out to a customer’s house to pressure wash the heck out of their deck. Or tile roof. Or limestone walkway. Or whatever they may ask us to clean. It truly is a joy, and we spread that joy around like barbecue sauce on dino ribs (or beans, if ribs aren’t your thing). Our expertise guides us in selecting the most effective way to go about the job without causing any damage, and our personal enjoyment guides us in providing service with a smile. We want to be your go-to for local pressure washing services. Contact Peace Frog to discover just how good customer service can be. SCHEDULE AUSTIN'S BEST CARPET CLEANING SERVICE TODAY!